McLaren builds cars known for raw speed, with power and handling sufficient to rearrange most body parts. But McLaren apparently doesn’t want to do just that forever. 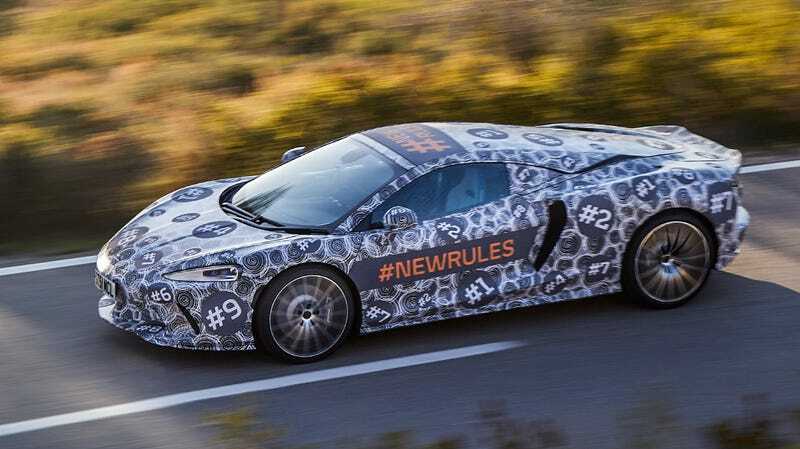 Last night it released photos of a camouflaged version of its upcoming new “Grand Tourer,” which has been promised to be a comfortable long-distance cruiser with the best power-to-weight ratio on the market. We don’t know everything about the upcoming McLaren GT car, not even its final name yet, but the company did drop a few hints at the Geneva Motor Show a few weeks ago. The car will be the fourth production model since the announcement of the company’s plan to release 18 new models by 2025, and we know it will come with a twin-turbo V8 with “competition levels of performance,” according to McLaren’s press release. It didn’t specify what sort of competition, but let’s assume more race track than cheese-rolling hill. We also know it’s to be positioned as a unique model among the range separate from the company’s existing Series models (McLaren likes to think of its product lineup as a series of, well, Series, with the Sport, Super, and Ultimate Series, just like at your local Amoco) and will be the only car directly inspired by the McLaren Speedtail hypercar. The interior is meant to be a little more accommodating and spacious for longer trips, and it’s meant to be the first in a new line of GT cars. ﻿Flewitt said: “It will be a car that combines competition levels of performance with continent-crossing capability, wrapped in a beautiful lightweight body. It’s a car that has been designed for distance and one that will also provide the comfort and space expected of a grand tourer. Judging from the photos, I’m not immediately in love with the squinty headlights and the relatively straightforward styling of the nose. Compared to the rest of the McLaren’s current lineup, it’s certainly toned down a little. The rear end, however, I really quite like, including the little speedtail lip. Do we call this the touring-tail?